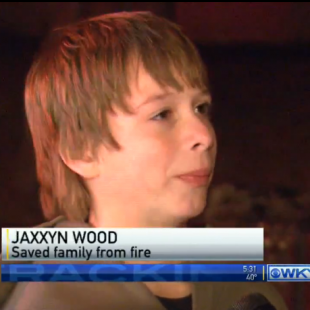 Jaxxyn Wood of Danville, KY alerted his family to a fire he noticed while playing videogames at 3:30 in the morning. One of the things I miss the most about being a kid is the endless energy I used to have. For instance, there was one occasion when I was 10 where I stayed up for nearly 3 days straight for no particularly good reason. It was just summer and I had a lot of soda and a videogame that I wanted to beat. And then beat again and maybe a third time after that. Nowadays, at the ripe old age of 26, I'm settling more into the old fart end of the spectrum. If I'm awake to see midnight it's generally a miracle. Thankfully, for the family of 12-year-old Jaxxyn Wood, he's still at the "rock and roll all night" stage of his life. Recently, while indulging in a post-Christmas 3:30 AM gaming session, the uniquely-named ragamuffin from Kentucky noticed an odor that smelled like "Legos on fire." Seeing smoke, he followed it to the kitchen where he caught sight of a fire in the family's ice machine. "I grabbed a plastic cup of water and put it out as much as I could, and then I went and got everybody," he said. Thanks to Jaxxyn's actions, the nine people staying in his home were able to evacuate safely. While this story leaves us a little curious as to how Jaxxyn knows what burning LEGO bricks smell like, we'll set that question aside to offer the kid our kudos. Just personally, if I had even noticed the gathering smoke enough to put down my controller, I probably would have panicked and gone screaming out of the house (who needs family anyways?). Perhaps the best part of this whole thing for Jaxxyn, of course, is the fact that he pretty much has free reign to stay up gaming as late he wants from now on. What are Mom and Dad really going to do when he can just pull out the "remember how I saved you all from a fiery death" card?